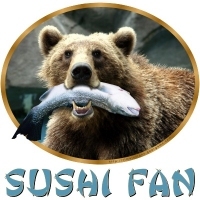 Who is a more authentic Sushi Fan than the great grizzly bear? No broiled, baked or fried fish for him! Holding a glistening fresh catch of the day in his teeth, this bold bruin fisherman is sure to please lovers of sushi, Japanese cuisine and bears alike! Buy it now on a t-shirt, hoodie, mug or other quality giftware item!